I can't believe I slept most of the day away, well at least the afternoon away, a clear sign I was exhausted after a heavy work week. Feeling refreshed, I tackled my second Carnival of Skirts project, another McCalls 3830. There was no if and or but about using M3830 again. 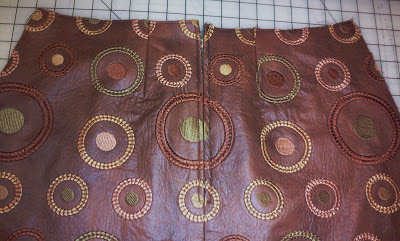 The fabric that I selected for skirt #2 is a soleil embroidered faux leather that I have had for a while now. Initially, it was pegged for a handbag and then pillows for my couch, but as you guessed the project was put on the back burner. In the process of organizing my fabric, I was reacquainted with it and just in time for Faye's sew along. 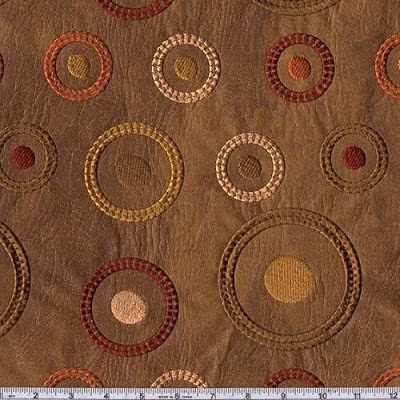 The faux leather can best be described as a retro print with colorful threads embroidered into circles over a saddle brown background. A print of this magnitude requires a simple pattern and M3830 is perfect. 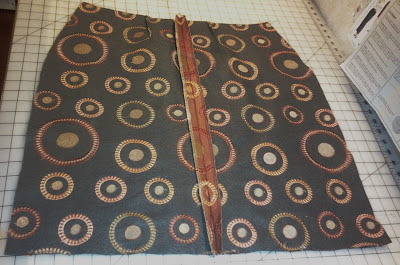 Here it is with the back seamed and waiting for zipper insertion. 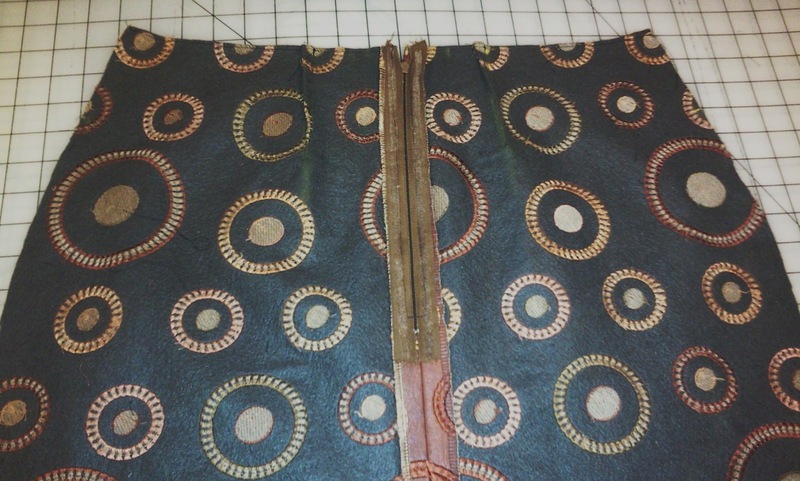 The center back raw edges serged and ironed open. 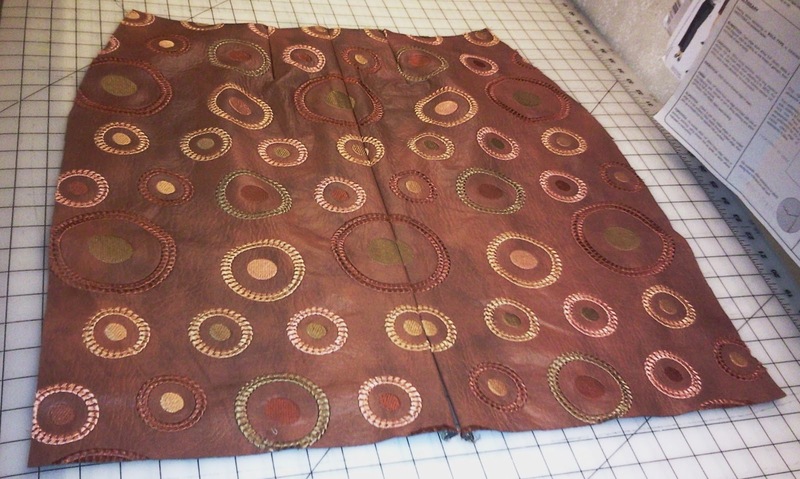 (used an ironing cloth over the faux leather, full steam ahead, ironed over it to force the serged edges to lay flat. Inserted the zipper which was a pain because the fabric started warping as I machine stitched. View of the underside with zipper and in my haste applied the fusible strip to the wrong side of the zipper, duh! At first I thought my sewing machine was bucking because of the felt back, then remembered that I fused adhesive to the wrong side, which was the actual culprit causing the feed dog to struggle to move the fabric. Had to place scrap fabric over the zipper then iron over it to remove the adhesive. With that taken care of I moved on to attaching the waistband facing, clipped the waistband's raw edges with the pinking shears and hand stitched to the lining as well the lining to the zipper tape. My burst of energy has worn off and will leave the hemming of the lining and fashion fabric for tomorrow. Have a Great Weekend and for those in the eye of Hurricane Sandy... stay safe. Great work Sheila. Wish I could find that fabric! Love the print match on the back of the skirt! You stay safe tomorrow too because I'm hoping the brunt of the storm goes through NYC instead of NJ...either way it's going to make getting to and going to work difficult this week. I love your skirt Sheila. I wish I could find that fabric also Faye! LOL! Thanks Faye. I purchased the fabric back in 2008 or 2009 from fulton fabric for $4.00/yd. It is available at J and O Fabrics, but will admit the price is steep. Thanks Carolyn, hoping it loses its gusto before its gets here. Thank you Necie. It is listed at J and O Fabrics, but the price is steep at least for me. Thanks Adelaide, since the print is large just a lil smootching was needed to line it up. That is a nice piece of fabric and you did a great job lining up the print in the back. Stay safe during the storm. I love that fabric. You have good taste. Its looking good. What an incredible skirt! I really love it. What are you going to wear with it? You've done a top job on your skirt. I hope you stay safe too. Love this skirt Sheila! You've done a fantastic job! Thanks Opal. Luckily everything has been suspended in anticipation of hurricane sandy. Thank you Carol. I will most likely pair it with a pull over sweater. Thanks Velosewer, the offices have closed and will enjoy the day off sewing. Hello Ms. Monica and thanks. Hi Serenity and thank you. Your question jogged my memory that I have a teflon foot.. Totally forgot I have one. I used a regular stitch of 2.3, 3.5 lengh and a standard foot. Hello Myra and thank you. I'm a new sewist and have acquired the awesomeness that is M3830. I made a skirt which I love already but I'm wondering if you altered the bottom width at all. Mine is more straight than pencil and I'd *love* to make a true pencil of this pattern in black. Hello Mrs. Smith and Welcome to Blog World. 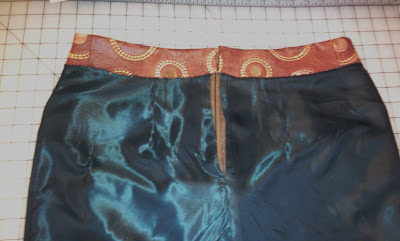 Yes, I pegged the bottom of the skirt for a more tapered look by removing about 5/8" from the side seams starting about 10" down from the skirt waist.